1. Coat two 9×9 square (“brownie”) pan with a light film of fat and line with parchment paper. 2. Combine sugar and salt. Sift together flour, cinnamon, powder, soda. 3. Whip eggs using the whip attachment on medium speed until thick, about 8 to 10 minutes. Increase the mixer speed to high and continue whipping until the eggs thicken to the ribbon stage, about 8 to 10 minutes. 4. Gradually add the oil, whipping on high speed until evenly blended. 5. Gradually add sugar, whipping at medium speed. Add the sifted flour mixture, mixing on low speed until just incorporated. 6. With a spatula, fold in the grated carrots and chopped hazelnuts, chocolate shavings. 7. Scale 12 oz. batter into each prepared pan. 8. Bake 350F/50 minutes. Allow cake to cool at room temperature for at least an hour and chill. A cold cake will be easier to cut for the mini cakes. 9. Cut out cakes with a 2 inch round cutter and place on a glazing rack. Set aside and prepare the Sour Cream Ganache glaze. 1. Melt butter in a medium sized sauce pot. 2. In the bowl of a mixer fitted with a whisk attachment, place sour cream and sifted sugar. 3. Bring butter just to a boil and add chocolate, stirring constantly so as not to burn. Lower heat and mix continuously. Bring mixture to 170F. 4. Add chocolate to mixer and mix slowly to incorporate. Increase the speed and mix to emulsify. Scrape down very well and mix on speed 3 for 3 minutes. 5. Pour the glaze over each cake. The ganache is thick so tap the wrack to help the glaze and make sure to cover the sides of the cakes. With a small spatula, smooth out the sides of each cake. Chill cakes to firm ganache. Remove cakes from rack and store in the refrigerator until the Cream Cheese Icing is complete. Ingredients: All ingredients should be room temperature to ensure a smooth icing with no lumps. 1. Mix together cream cheese and butter in a bowl fitted with a paddle attachment. Add sour cream, scraping well. 2. Add powdered sugar. Mix and scrape bowl. 3. Add chocolate shavings and mix. 4. On a sheet pan lined with parchment paper, line ring molds with acetate. Spread a thin even layer onto acetate. Line rings again with the icing-acetate in place. 5. Using a small piping bag, pipe a ring of icing around the bottom of each ring. 6. 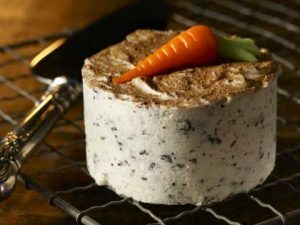 Place a chocolate glazed carrot cake inside of each mold. 7. Using a piping bag with a small round tip, fill in the space surrounding each cake. With a small spatula, smooth the top and level.